Welcome to a brand new blog post! I went to York Designer Outlet last week and I thought that I would talk to you all about it. York Designer Outlet is owned by McArthur Glen. McArthur Glen is known for their designer outlet shopping centres where you can snag an amazing product for a discount of the price that you would find on the high street. They have quite a few stores including York, Nottingham and many more. The stores in the York Outlet include Nike Factory Store, Levi Jeans, M&S Outlet and many more. A square store with a black bar at the top with Vans in bold white writing with rectangular glass windows with a red rectangular poster saying Up To 50% Off in bold white font on a bright background. We entered the beautiful building, and slolwy strolled towards the first store on our list, which was Lindt. 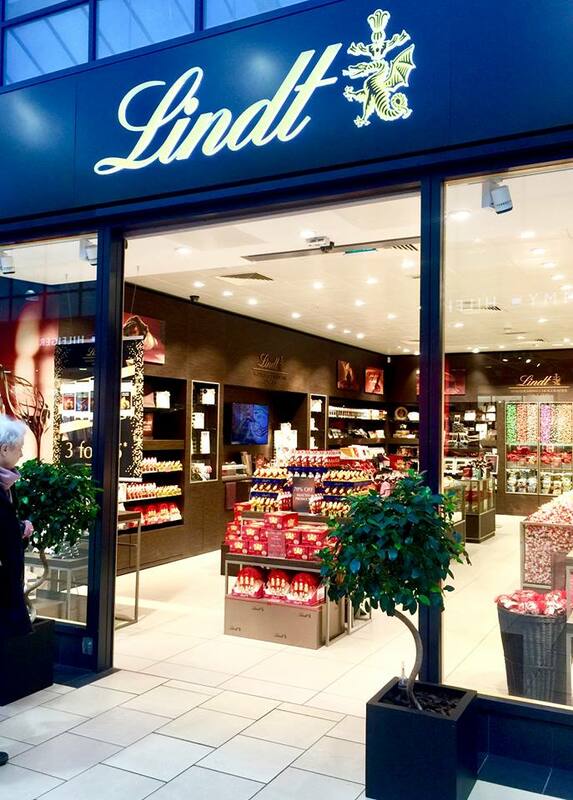 Lindt are a luxurious swiss Chocolate brand who are famous for items such as the Gold Bunny and the Lindt Lindor. Myself and Luke entered the store due to seeing on the window of the store, that there was a sale going on, so we thought that it would be worth a wonder in. We perused the stands and decided to purchase a Gold Reindeer a piece due to them being only 99p. We then decided that we would treat ourselves and get a Lindor Pick and Mix bag. 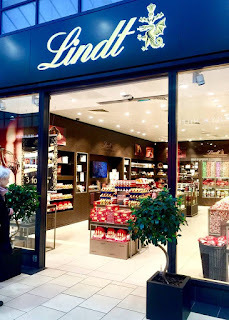 If you haven't heard of this before, then the concept of it is, that you grab a bag and choose the amount that you want which equals to so many Lindor truffles, then fill with varied flavours of Lindor truffles to your hears content. These include Irish Cream, Strawberries and Cream, Hazelnut, Cappuccino and many more. We paid and swent on to wonder at more stores. A black square store with a blue front with Lindt in bright gold cursive font with an array of bright gold packaged chocolate reindeers on a black rectangular shelf on a bright background. After Lindt, we wandered on over to Cadburys to carry on the chocolate fix. We had a look around and ended up coming out with some stuff for Luke. I did nearly get something but I wasn't really sure on what I wanted. I did like the fact that they had Cadbury printed cushions on sale. 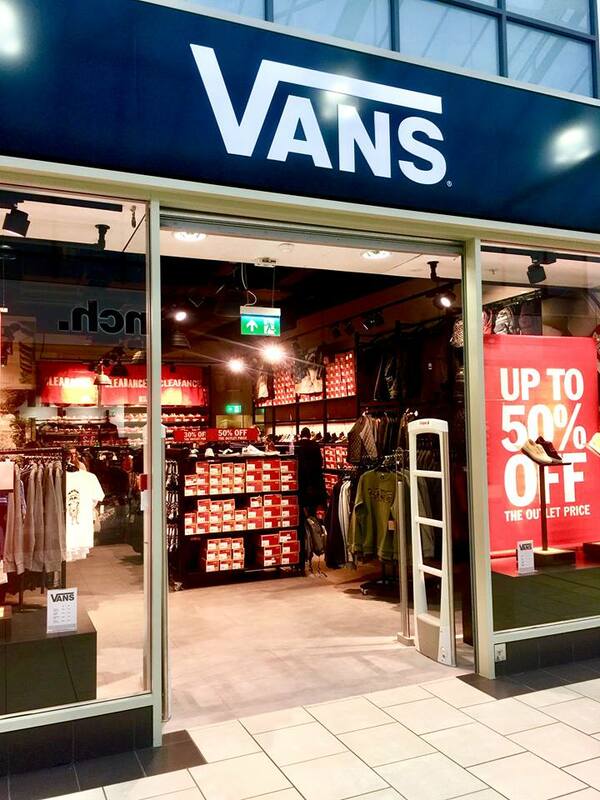 Carrying on from the shopping front, I had to pop into the Vans store, as that it always a must when myself and Luke come to the Outlet. I had a browse, and after a while, I decided to buy a light blue Snapback, as I have slowly being digging these more and more at the moment. I'm probably far too late to the trend, but ah well. We then wandered on through to Levi's, Molton Brown and Gap Outlet to have a look, but we didn't find much, and honestly myself and Luke needed food. We made our way up to the lavish food court, which is filled with restaurants such as, Wagamama, Patisserie Valerie, Pizza Express, Ed's Easy Diner and much more. We decided to go for a McDonalds just due to it being quick and easy to order and eat. 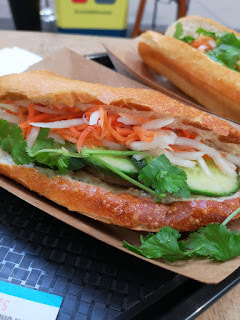 Once the food was demolished, we made our way back down to the plethora of shops. The next two places on our list were Whittards and Yankee Candle. I was looking for the new Blueberry Cheesecake Hot Chocolate that's available at the moment, as I love Blueberries and I love Cheesecake, so I wanted to see what it was like in Hot Chocolate form. Luke loves Yankee Candle, but sadly the main store was closed due to refurbishment, but luckily there was a pop up Yankee store, so we had a look and sniffed a few of the candles. Sadly, none of the candles were screaming out to Luke but we had a good time sniffing and looking. Next was Dr Martens, Penhaligon and Clarks, We popped into these three to mainly have a look. 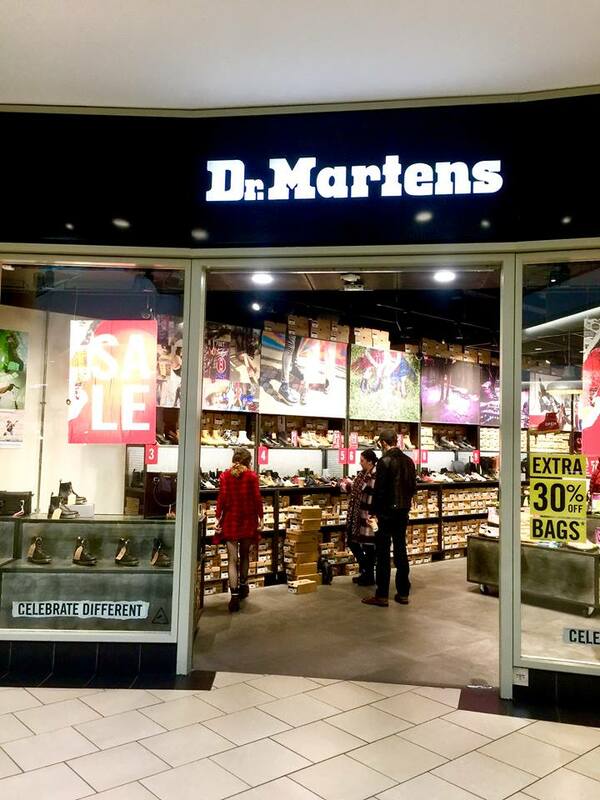 I nearly bought something from Dr Martens, but I think that with the Docs Outlet store, you have to know exactly what you want. I think the next time that I'm in, I'll make sure I know what I'm looking for. We popped into Penhaligon mainly to check it out as its a cute luxurious beauty business. I think that again, I needed more time to check it out, instead of worrying about other shops and the train home. Clarks was a visit due to them having a sale but sadly neither of us found anything that we wanted. 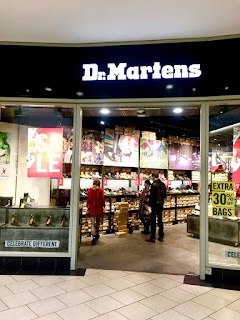 A black rectangular store with a black headboard saying Dr Martens in bold white font with an array of different coloured boots and shoes at the front of the store on a bright background. Last on our list was Sunglasses Hut. This is the main reason that Luke comes to the Outlet due to them having designer sunglasses at a discounted price. We browsed the store, and after trying on a few pairs of sunglasses, Luke decided on a nice pair of sunglasses. Whilst that was happening, I decided to try on a few, including a beautiful pair of aviators from Polo Ralph Lauren. One day, maybe. 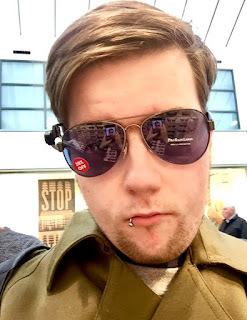 A selfie of a white young male with medium brown hair with a beard and a silver lip ring wearing a pair of dark metal aviators with Polo Ralph Lauren in small white font wbilst wearing a khaki trenchcoat on a bright background. Have you ever been to any of the McArthur Glen Designer Outlets before? Let me know down below! Check out York Designer Outlet. I hope that you've enjoyed this shopping based blog post and I hope to see you next time for another blog post!